In Great Conservative Accomplishments Panderbear discussed the great accomplishments conservatives can point to and found that, well, there weren't any. At least there haven't been any since President Eisenhower built the interstate highway system. Republicans have fought every great advance in American society tooth and nail. Panderbear resists characterizing himself as a liberal, because he decides each issue via fact-based logical reasoning, not based on ideology. 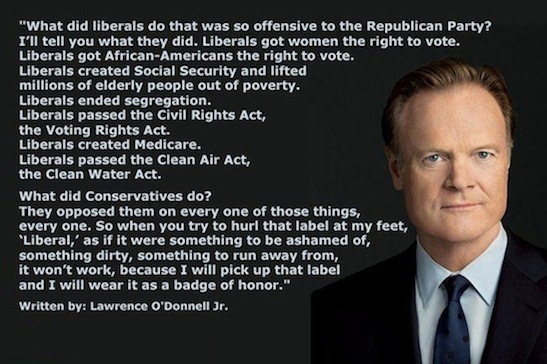 Nevertheless, he is inclined favorably toward the sentiments regarding liberalism expressed by Lawrence O'Donnell.